he Tuesday bird walk went to the Shelly Road side of the Englishman River Estuary in Parksville. The morning was partly cloudy with calm winds. We watched in fascination as a Hairy Woodpecker went into a hole in the tree near the trail and started excavating the hole for it’s nest. Two Downy Woodpeckers were tapping trees nearby. We had good looks at a Swainson's Hawk flying overhead---an unusual sighting for this area. For the first time this season, we heard and then saw several Orange-crowned Warblers feeding near the trail. Yellow-rumped Warblers and Ruby-crowned Kinglets were along the trail for most of the morning. A Band-tailed Pigeon was perched in a tree over the trail--another first of the season bird. 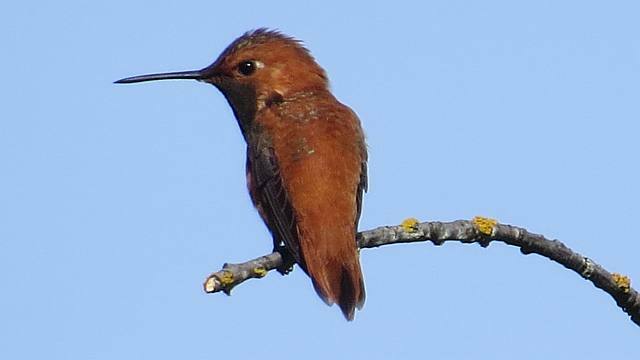 Rufous Hummingbird: Len Bettam Photo. The Tuesday bird walk on April 05, 2016 will be going to the Plummer Road side of the Englishman River in Parksville. Meet at the Parksville Community Park at the Lions Club Kids Playground parking area at 9:00 a.m. or at the corner of Plummer Road and Shorewood Drive at about 9:10 a.m. The Sunday bird walk went to Neck Point Park in Nanaimo. The morning was cloudy with a strong wind off the Strait of Georgia, however midway through the walk the clouds dissipated and we finished off with the sun shining brightly. 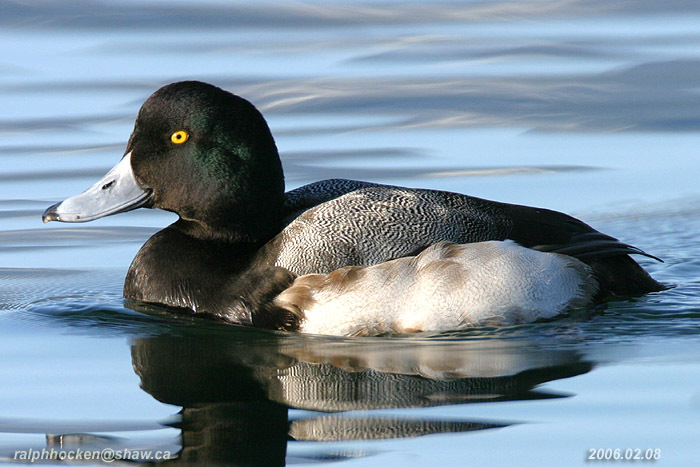 Highlights included seen a large flock of Barrow’s Goldeneye and one Lesser Scaup near the shore. Over seventy Thayer’s Gulls and two Bonaparte’s Gulls were among the many gull species we saw during the morning. Two Ruby-crowned Kinglets were spotted feeding next to the trail giving us excellent views. The Tuesday bird walk went to the Somass Estuary in Port Alberni. The morning was partly cloudy with calm winds and a few light showers. 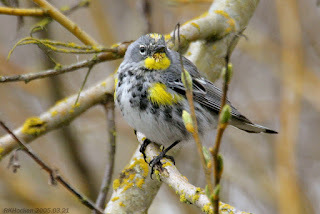 We saw a large number of Yellow-rumped Warblers singing and hawking insects throughout the morning. Song Sparrows were belting out their song and were very plentiful. A great number of Marsh Wrens perched and entertain us on the walk. Greater White-fronted Geese and Canada Geese were feeding in the fields. Bald Eagles along with Red-tailed Hawks circled high overhead. Marsh Wren: Ralph Hocken Photo. 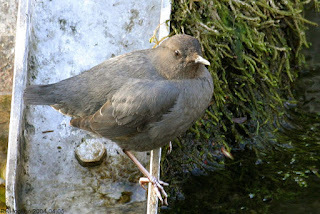 The Tuesday bird walk on March 29, will be going to the Shelly Road side of the Englishman River in Parksville. Meet at the Parksville Community Park at the Lions Club Kids Playground parking area at 9:00 a.m. ,or at the end of Shelly Road on the ocean side of highway 19a at about 9:10 a.m. The Sunday bird walk on April 03, 2016 will be going to Bowen Park in Nanaimo. Meet at the Birdstore at 9:00 a.m. or at the main parking lot near the lawn bowling green at Bowen Park off Bowen Road at about 9:20 a.m. The Tuesday bird walk went to the Somass Estuary in Port Alberni. The morning was partly cloudy with calm winds and a few light showers. 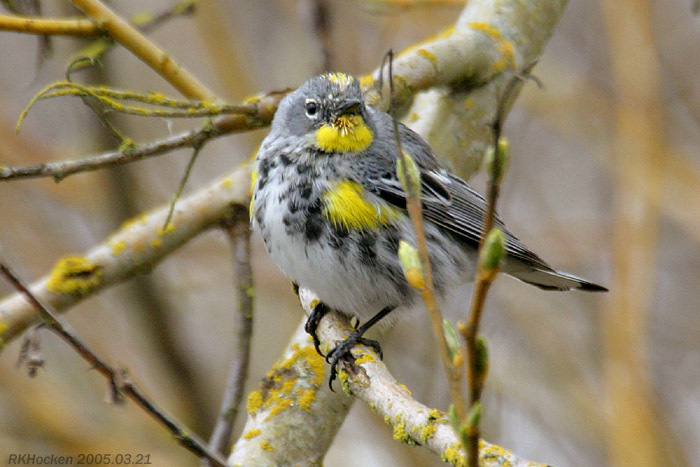 We saw a large number of Yellow-rumped Warblers singing and hawking insects throughout the morning. Song Sparrows were belting out their song and were very plentiful. A great number of Marsh Wrens perched and entertain us on the walk. 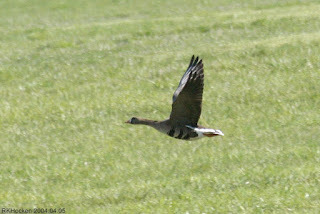 Greater White-fronted Geese and Canada Geese were feeding in the fields. Bald Eagles and Red-tailed Hawks circled high overhead. The Tuesday bird walk on March 29, will be going to the Shelly Road side of the Englishman River in Parksville. Meet at the Parksville Community Park at the Lions Club Kids Playground parking area at 9:00 a.m. Or at the end of Shelly Road on the ocean side of highway 19a at about 9:10 a.m. The Sunday bird walk went to Nanaimo River Estuary in south Nanaimo. The morning was cloudy but warm and the winds were calm. 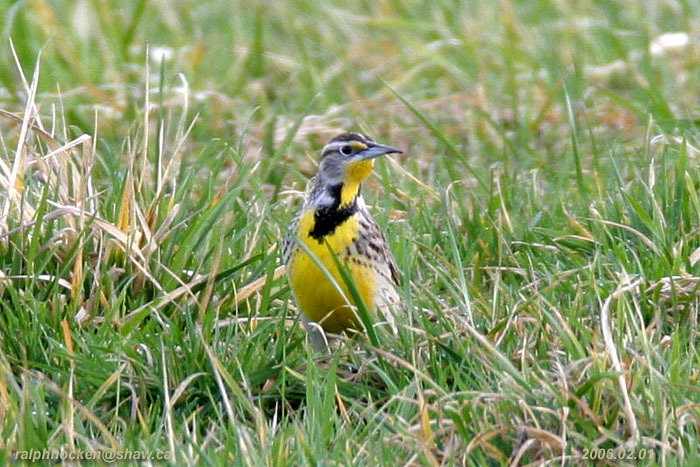 We saw four Western Meadowlarks perched in a short bush not far from the trail. Tree Swallows and Violet-green Swallows were hawking insects overhead all morning. A Northern Shrike was perched on a short bush and we watched as it flew out for prey several times and returned to it’s perch. Red Crossbills were spotted in the Stephenson Point area of Nanaimo. 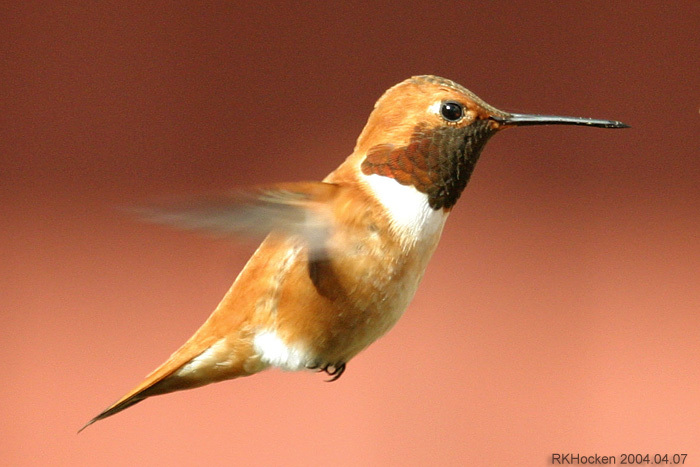 We have received several reports of Rufous Hummingbirds returning in Nanaimo, Nanoose Bay and Parksville. More than twelve Red Crossbills were seen visiting a backyard in the Cedar area. The Tuesday bird walk went to the Brant viewing platform in Qualicum Beach and the Little Qualicum River Fish Hatchery. The morning was mostly sunny with a few clouds and the winds were calm. Black Turnstones, Black-bellied Plovers, Black Oystercatchers, Brant Geese, Bonaparte's Gulls, California Gulls, Thayer's Gulls and a Western Gull were plentiful on the gravel bars offshore from the viewing platform. Two American Dipper’s were seen just off the road, near the parking lot at the fish hatchery, singing and catching fish. Further along the trail we saw and heard Red-breasted Sapsuckers tapping on the top of the hydro poles. 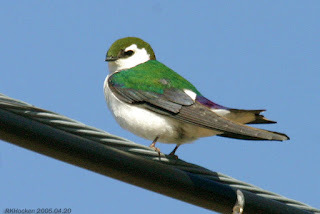 There were large flocks of Violet-green Swallows and Tree Swallows flying high overhead, hawking insects. 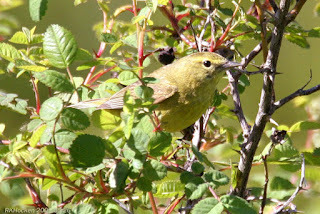 The Tuesday bird walk on March 22, will be going to Port Alberni, Meet at the Parksville Community Park at the parking lot near the Lion’s Kids Playground at 9:00 a.m. or at the parking area in Port Alberni near the river (follow highway 4 into Port Alberni until you come to the tee intersection. Turn left and then right onto the parking area along the water) We will meet there about 10:00 a.m. The Sunday bird walk on March 27, 2016 will be going to Neck Point Park in Nanaimo. 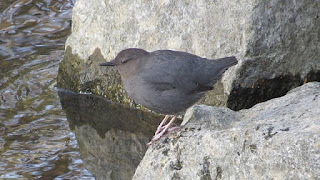 Meet at the Birdstore at 9:00 a.m. or at the parking lot at Neck Point Park off Hammond Bay Road at about 9:15 a.m.
American Dipper: Len Bettam Photo. The Tuesday bird walk on March 22, will be going to Port Alberni, Meet at the Parksville Community Park at the parking lot near the Lion’s Kids Playground at 9:00 a.m. or at the parking area in Port Alberni near the river ( follow highway 4 into Port Alberni until you come to the tee intersection, turn left and then right onto the parking area along the water) we will meet about 10:00 a.m. 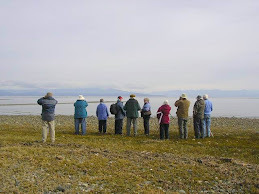 The Sunday bird walk went to Rathtrevor Beach Park in Parksville. We were greeted with very strong winds and rain showers that continued for the morning. 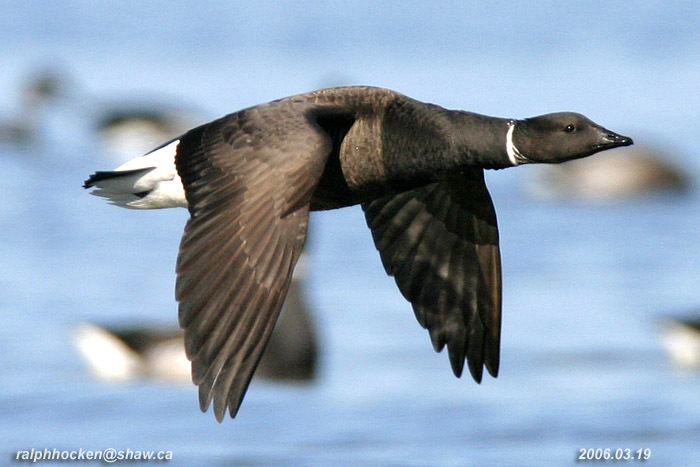 We spotted ten Brant Geese fly low over the high whitecaps and circle back to calmer waters. 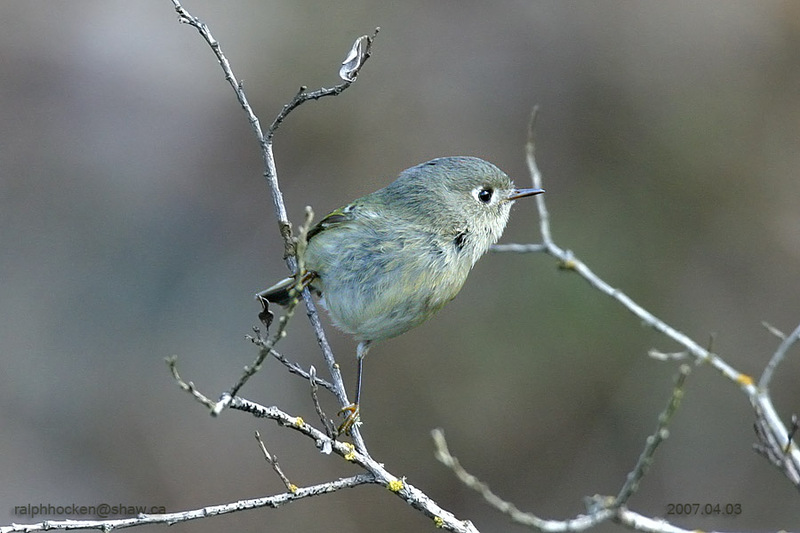 We had a close encounter with a large flock of Ruby-crowned Kinglets and Golden-crowned Kinglets feeding on the short bushes near the trail. They entertained us royalty and close up. Two Yellow-rumped Warblers were seen near the Brookwood Pond in north Nanaimo. Several reports of Rufous Hummingbird have been seen in Parksville. 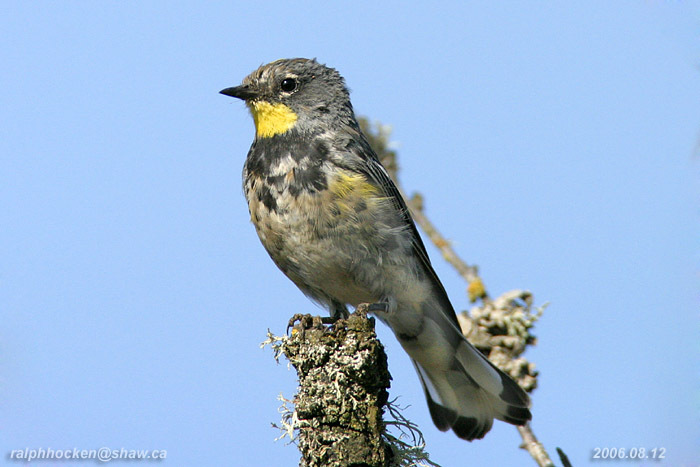 Yellow-rumped Warblers were seen in a backyard in Ladysmith. The Tuesday bird walk went to the Little Qualicum River Estuary in Qualicum Beach. The morning was cloudy with strong (surf up) winds off the Strait of Georgia. Large numbers of Brant Geese, Long-tailed Ducks, Black-bellied Plovers, Black Turnstones and Black Oystercatchers were seen from the viewing platform in Qualicum Beach. Gadwall, Barrow’s Goldeneye, Eurasian Wigeon, large numbers of Surf Scoters, White-winged Scoters, and Black Scoters were seen from the estuary. A Cooper’s Hawk was perched on a short snag. One Turkey Vulture and five Trumpeter Swans were seen on the way to the bird walk. 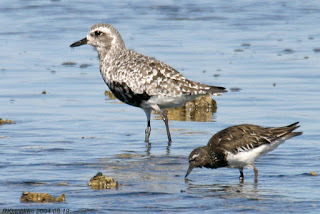 Black-bellied Plover and Black Turnstone: Ralph Hocken Photo. Everyone is welcome to join us for a 2-3 hour bird walk on the Sunday and Tuesday mornings. We leave from the Store at 9 a.m. on Sunday Mornings and go to a different location in and around Nanaimo and from the Parksville Beach Community Park at 9 a.m. on Tuesdays and go to different areas in and around the Oceanside area. *******************************************************************************The Tuesday bird walk on March 15, 2016 will be going to the Little Qualicum Fish Hatchery north of Qualicum Beach. Meet at the Lions Club Kids playground parking lot at Parksville Bay at 9:00 a.m. or at the Brant viewing platform in north Qualicum Beach at about 9:15 a.m. The Sunday bird walk on March 20, 2016 will be going to the Nanaimo river estuary in south Nanaimo. Meet at the Birdstore at 9:00 a.m. or at the end of Raines Road at about 9:30 a.m.
We had our first of the season Rufous Hummingbird at the feeder at 7:25 a.m. this morning. Rufous Hummingbird Photo by Ralph Hocken. (surf up) winds off the Strait of Georgia. Large numbers of Brant Geese, Long-tailed Ducks, Black-bellied Plovers, Black Turnstones and Black Oystercatchers were seen from the viewing platform in Qualicum Beach. Gadwall, Barrow’s Goldeneye, Eurasian Wigeon, large numbers of Surf Scoters, White-winged Scoters, and Black Scoters were seen from the estuary. A Cooper’s Hawk was perched on a short snag. One Turkey Vulture and five Trumpeter Swans were seen on the way to the bird walk. The Tuesday bird walk on March 15, 2016 will be going to the Little Qualicum Fish Hatchery north of Qualicum Beach. Meet at the Lions Club Kids playground parking lot at 9:00 a.m. or at the Brant viewing platform in north Qualicum Beach at about 9:15 a.m. The Sunday bird walk went to Neck Point in Nanaimo. The morning had a little bit of everything—it was cloudy with strong winds with heavy rain at times, lighter rain other times, and even a bit of sunshine with calm winds at times. We saw six Yellow-rumped Warblers feeding high up in the trees during the morning. Brandt Cormorants, Common Murre, Pigeon Guillemots and Marbled Murrelets were seen on the Strait of Georgia. Five Trumpeter Swans flew low over the water heading up the Strait. The Tuesday bird walk went to Little Qualicum River Estuary. The morning saw heavy rain, which made for a short stay at the Brant viewing station, before heading indoors for coffee. Then a very quick, wet visit to the estuary had quite a few Great Blue Herons hunched over waiting the storm out, and there was also one lone Snow Goose amongst the Canada Geese. 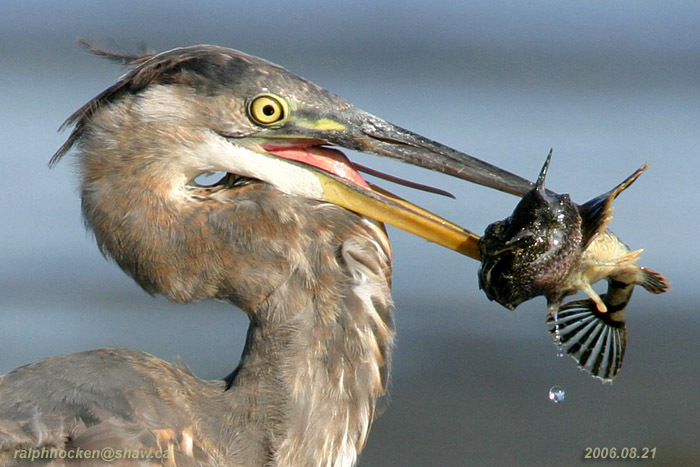 Great-blue Heron: Ralph Hocken Photo. 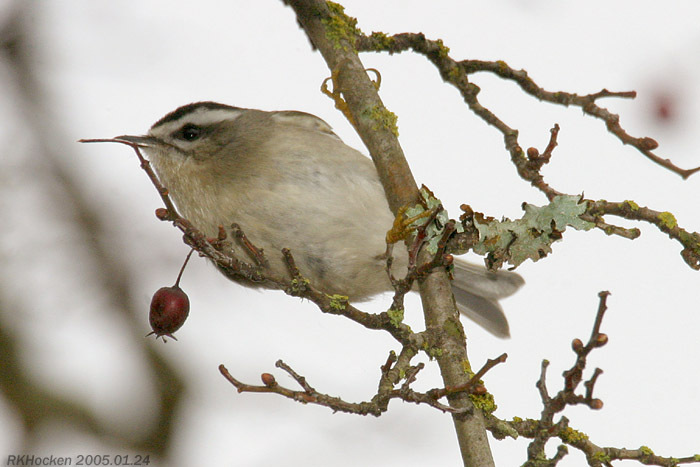 5 enthusiastic birders, including visitors from Edmonton and Seattle fleetingly saw 26 birds. 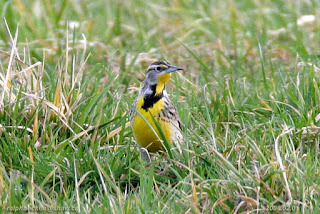 The Tuesday, bird walk on March 08 will see a return trip to the Little Qualicum River Estuary. Meet at Parksville Community Park at the Lions Club Kids Playground Parking lot at 9:00 a.m. or at the Brant viewing platform in north Qualicum Beach at about 9:15 a.m. The Sunday bird walk on March 13, 2016 will be going to Rathtrevor Beach Park in Parksville. 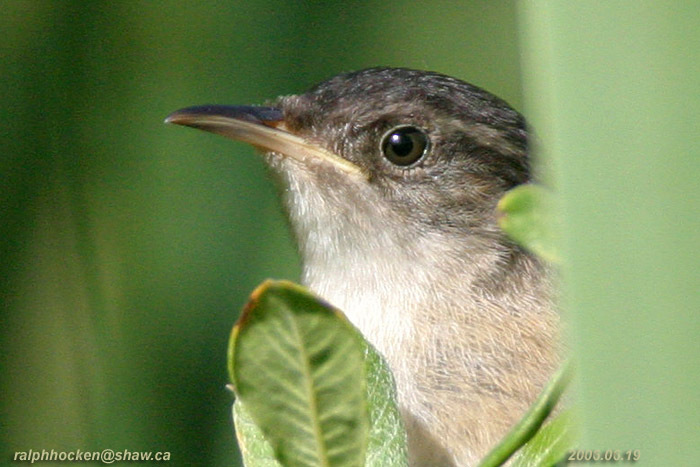 Meet at the Birdstore at 9:00 a.m. or at main parking lot at Rathtrevor at about 9:30 a.m.